At Lenbrook, a premier Life Plan Community in Atlanta planning a $100 million expansion, dining is more than just sustenance. It has sparked resident engagement and brought seniors and staff together in ways perhaps never imagined. 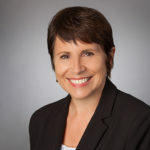 Felecia Sveda, Lenbrook vp of hospitality services, likens Lenbrook’s dining program to baseball—bringing residents from the stands to the sidelines to the playing field to create alignment that has had an exponential impact. Dining is at the forefront of The Lenbrook Difference, and it has become a marketing differentiator and competitive advantage. Executive chef Todd Clements came to Lenbrook from Trezevant LifeCare Community in Memphis, TN, where he directed a food service team of 30. Prior to that, he honed his craft while serving as executive chef at Highlands Country Club in North Carolina. Formally obtaining his Culinary Arts education at the Art Institute of Atlanta and Johnson & Wales University in Charleston, SC, he began his career as a sous chef for Guckenheimer catering and Rainwater restaurant in Alpharetta. Many of the residents at Lenbrook have maintained their country club memberships and still occasionally dine there, much like it was at Trezevant where some residents knew Clements from his days at the country club. 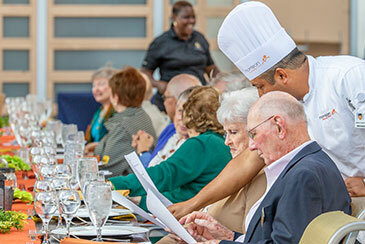 That gave him insight into the level of food and service his culinary team could bring Lenbrook’s well-traveled residents in its four primary dining venues and multiple family-style dining rooms located within the Health Care Center. 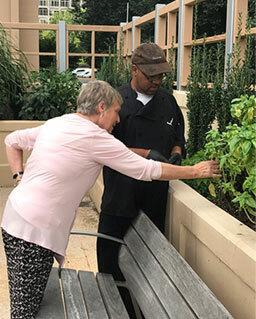 Lenbrook resident Jackie Durant initiated the herb garden to provide fresh herbs for the kitchen. 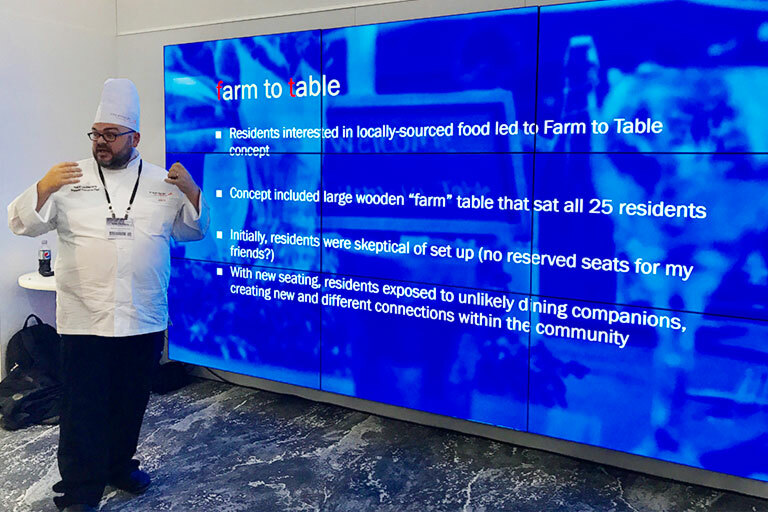 Today with so much prefabricated food in the marketplace, Clements emphasizes cooking from scratch, resident wellness, sustainability of food sources and honoring local flavors. He and his culinary staff use only fresh fruits and vegetables. Seafood is flown in daily. Beef is hand-cut on the premises, and 95 percent of desserts are baked from scratch at Lenbrook. Sveda said Lenbrook can attract top chef talent because it gives its chefs total creative reign but also has dietitians to help with prescribed diets. Clements loves getting everyone involved, working together as one team. Last year, he heard about a gardening club at Lenbrook that was asking about edible herbs and locally sourced food. His own biggest hobby outside of work is growing and raising his own food, so he got the grounds crew to help with the gardens. That prompted a monthly Farm-to-Table event at a 24-seat table, hand-built in-house from several old broken tables which were refinished. 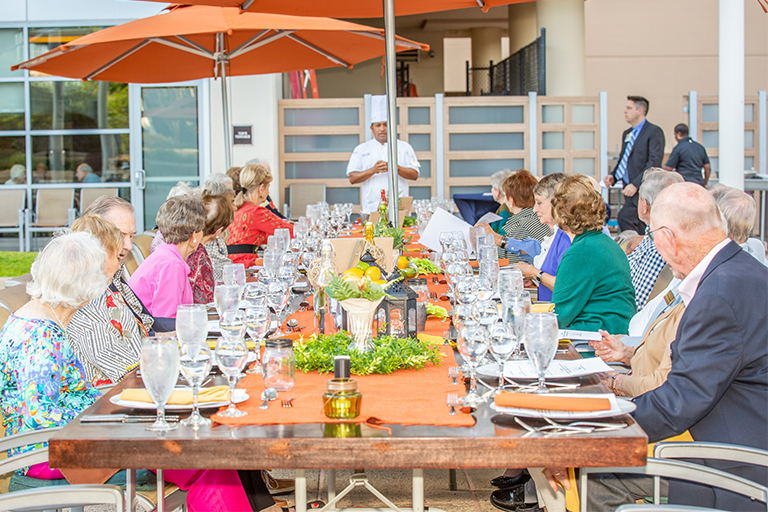 The first event featured a prix fixe menu of locally sourced foods paired with wines from Chateau Elan in Braselton. Held outdoors, it sold out at $60 per person. Resident concern for the size of the kitchen and how food was prepared for Lenbrook’s various restaurants led to Clements starting a monthly kitchen tour. Showcasing Lenbrook’s competent culinary team and the strategic design of putting dining in the core of the building resulted in raving fans—residents who have pride in the kitchen and food prepared there. A Dining Services Resident Committee—the “hot” place to be—facilitates two-way communication between dining management and the committee. The entire dining team attends for real time discussions and decisions that impact program direction, rather than personal issues. Spaces are being designed to support programs that feel purposeful, meaningful and flexible to residents. Last summer when Lenbrook was opening a new multi-functional venue, residents voted on the name—The Club. They also voted on the dark, light and decaf blends to be served when it functions as a coffee shop like Starbucks daily 6 am to 4 pm and features large tables that spawn daily conversation. When the happy hour crowd arrives, they often break up tables for a more intimate setting. To promote social connectivity, the Breakfast Club inspired the idea of free coffee during breakfast hours. Happy Hour inspired the idea of Happy Hour prices. The Bistro renovation evolved over time to meet resident requests. Originally intended to serve soup and sandwiches, it now has three hot entrees and six sides, as well as action and “grab and go” stations, soups and made-to-order sandwiches. Its casual environment and quickly prepared menu items prompted an organic movement toward larger community tables. The Lenbrook Flexible Fund allowance simplifies mealtime. A private dining room can be reserved for a special event, and parties can be catered in residents’ apartment homes. “Room service” meals are also available. Ever mindful of the industry’s staffing shortage, Clements says his number one job and love is coaching and developing his staff, watching them grow.